Scientific name for Green Turtle (Chelonia mydas). An extreme "fear of turtles Chelonaphobia". "Scientific name for turtle Testudines". Green sea turtles get their name from the green color of their fat in their bodies and not from their skin color. The green turtle meat is a well regarded food and the cartilage scraped form the plastron of slaughtered green turtles is the base for green turtle soup. The green turtle’s round head is comparatively smaller than those of other turtles. The green turtle’s serrated lower jaw enables it to tear sea grass. Green sea turtles eat predominantly a vegetarian diet. From June through October, Green sea turtles are found in Long Island Sound and Long Island’s eastern bays. They congregate near their food source which is either plants living just below the surface of the water or more deeply submerged aquatic vegetation. 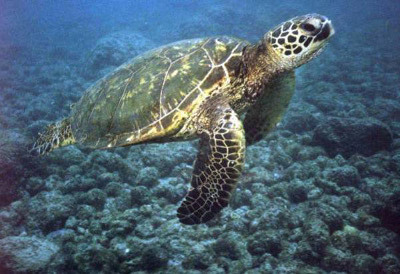 The Atlantic and Caribbean populations are the largest among green turtles. Green adult female turtles in Florida average 3.3 feet and 300 pounds. Hatchlings diet includes small mollusks, crustaceans, sponges and other tiny sea creatures. When these turtles grow around 8 to 10 inches they become vegetarian, feeding on mostly algae and sea grasses. The Green turtles habitat includes coral reefs, bays, estuaries and tropical costal water of the Atlantic, Pacific, Indian Oceans and Mediterranean Sea. Listed as threatened and endangered species since 1978. Their population increased in the U.S. and declined elsewhere. They are hunted legally by native Moskito tribes in Nicaragua. This tribe hunts an estimated 10,000 sea turtles annually. Green sea turtles and Black turtles are nearly genetically identical but they both inhabit different regions. For this reason researches feel some researchers consider the Black turtle a sub species of Green turtles. Other feels that because of their difference in physical characteristics and behavior they are considered a separate spices.